Heavy Duty Garage Racking shelving unit 5 tier 200kg UDL 1800mm x 1500mm x 450mm. 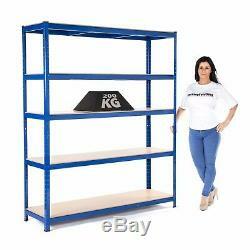 Heavy Duty Garage Shelving 5 Levels 1800mm H x 1500mm W x 450 D - 150KG UDL. FREE NEXT DAY DELIVEREY + FREE RUBBER MALLET. This great Shelving bay deal is ideal for the office, home, garage, or store room, if you are looking for a professional product for a keen price this is the range for you. With super smooth solid 7mm MDF shelves which will hold a load capacity of up to 200 kg UDL. Up to an Amazing 200kg UDL per shelf. Each shelf is a Smooth 7mm MDF sheet which is stronger than chipboard. Made from 1.2mm thick Steel. Powder coated in a Blue & Orange Gloss for long lasting finish. Adjustable shelf height every 35mm. Supplied with plastic feet and top caps. Tested & certified to EU & International Manufacture & safety standards. Boltless easy to assembly, tap together with a rubber mallet. PLEASE NOTE THAT THE 300MM DEEP UNIT DOES NOT HAVE A SHELF SUPPORT. UDL - Uniformly Distributed Load. Any product you return must be in the same condition you received it and in the original packaging. Heavy Duty Garage Shelving 5 Levels 1800mm H x 1500mm W x 450 D - 150KG UDL FREE NEXT DAY DELIVEREY + FREE RUBBER MALLET Product Information: This great Shelving bay deal is ideal for the office, home, garage, or store room, if you are looking for a professional product for a keen price this is the range for you. With super smooth solid 7mm MDF shelves which will hold a load capacity of up to 200kg UDL. The item "Heavy Duty Garage Racking/Shelving Unit 200kg UDL Per Shelf1800mmx1500mmx450mm" is in sale since Friday, October 27, 2017. This item is in the category "Home, Furniture & DIY\Storage Solutions\Storage Units". The seller is "shelf_racksolutions" and is located in Castleford.